Have you or a loved one suffered personal injuries in the Kendall area? If so, it is critical that you contact the best Kendall personal injury lawyer you can identify as quickly as possible since there may be time limits on your claim. You may be entitled to receive compensation for your injuries and damages. That is where the Kendall personal injury attorneys at the Wolfson Law Firm can provide help to you and your loved ones. If you have been injured in any kind of accident in the Kendall area, please make sure to call our Kendall accident lawyers for help. For free consultations, call the Miami personal injury law firm of the Wolfson Law Firm at (305) 285-1115 and tell us about your case. With over 50 years of personal injury experience with accident cases, our attorneys understand what is necessary. We will discuss your case and advise you on the best course of action. After that, you get to make the decision of what to do next. You may be entitled to recover compensation, including damages for medical treatment, lost income, loss of earning ability in the future, scarring, pain and suffering depending on your case. If you request us to represent you, please keep in mind that we handle personal injury and wrongful death cases on a contingency basis. This means that you do not pay anything until we recover compensation. In addition, all our consultations are free. As a suburb of Miami, the town of Kendall is a very busy place. Kendall is served by a variety of roads and public transportation. The Metrorail has two stops: one at Dadeland North and one at Dadeland South. These stations provide connections from Dadeland to the several commercial centers like the City of Coral Gables, the Downtown Miami area, and the Miami International Airport. The Dadeland South stop in particular is a significant transit depot for the area. The Miami-Dade Metrobus also serves the town throughout the area. There are also several major roads that intersect Kendall: U.S. Route 1, U.S. Route 94, U.S. Route 874, and U.S. Route 986. 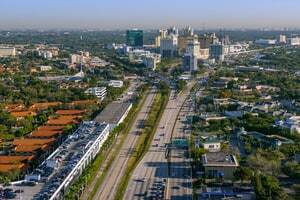 Moreover, the town contains the Miami-Dade College Kendall Campus, as well as The Falls shopping mall. The Kendall accident lawyers at the Wolfson Law Firm are standing by to help you. For your free consultation simply call us at (305) 285-1115 at any time that is most convenient for you. We look forward to the opportunity to help you and your family after your Kendall accident and injury.